With the Thanksgiving holiday right around the corner, and November, being National Family Caregivers month, there is no better time to start thinking about the ways in which you can thank the special caregiver in your life. Whether this caregiver works full-time or part-time or anywhere in between, when a family member, loved one or friend is helping to care for a special senior in your life, it is important that you are taking the time to show them just how special they are. These senior caregivers are the ones that have sacrificed their free time, their sleep and at times their sanity to put the needs of others in front of themselves. It is a difficult job and one that often doesn’t come with enough gratitude. 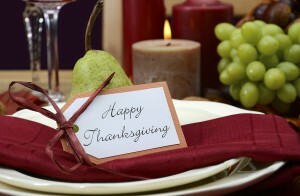 Here are a few tips on how to give thanks to the special caregiver in your life this November. Express your thanks with a kind message. Many caregivers love hearing they are valued. Give a day off. Come in and cover caregiving responsibilities for an entire day so the caregiver can tend to their own needs and take care of themselves for once. Show them you care. A small gift, a token of appreciation or some pampering can go a long way. Plan a special activity. Sometimes the gift of an experience is the best type of gift there is, plan a special activity for this caregiver and their closest friends and family members to show your gratitude. Help with Thanksgiving preparations. If the caregiver in your life also happens to be in charge of Thanksgiving preparations, step in and help with this important undertaking so they have a little less on their plate. Plan a special night out for the caregiver so they can blow off some steam and have a little fun. Organize for respite care that can come in and provide “fill-in” care services for the care provider whenever they need some time for themselves. Clean the caregiver’s home or organize for a maid to come in and clean so that they have one less thing on their list of ‘to-dos’ to take care of during the busy and at time stressful holiday season. Offer a bonus for paid caregivers. Even though many caregivers are compensated for their time, most go above and beyond the call of duty when providing senior care. A little extra bonus can go a long way in helping them feel appreciated. Plan a special activity for the senior receiving care. For many caregivers, seeing their senior loved one happy and healthy is one of the best rewards there is. While most of us know that we should always be giving “thanks” to the special caregivers in our lives all year round, this November, take the time to really thank the caregivers that you know. Their tireless work and enduring commitment to helping seniors in need is something that everyone should be thankful for this year.